The period of creation before time as we know it existed is known to the Australian Aboriginal people as The Dreaming. The lessons of this period of enlightenment and the ability to live in peace and harmony are encapsulated within The Dreaming and passed on to the next generation in the oral traditions. This is when the very essence of human nature came to be understood. Dreamtime is a word first used by a European anthropologist in the early 1900’s to define what he perceived, as a religion. He used this word to describe the all-encompassing mystical period of Aboriginal beginning. However, the Aboriginal people do not worship any single Deity or other Gods. They built no monoliths, memorials or idols, nor did they have an organized religion. They lived by the lores of the Creator and Ancestral Spirits of the diverse landscapes, sky, creatures and plants of Australia. The art, stories, songs and dances, became well known as part of the Dreaming, but it is still little understood. The Dreamtime is part of the oral tradition, and is only one aspect of a very complex spiritual belief system, the Dreaming. The Dreamtime stories, are the oral form of the spiritual Dreaming, which comprises: Art – the visual form, Customs – the practical form, Music – the acoustic form, Totems – the spiritual forms, Lore – the cultural form, Lands – the physical forms. Altogether, they form an all-encompassing, mystical whole. Over the last 220 years, since colonization of Australia, non-indigenous people have perceived these art forms as separate entities, rather than as part of a whole. The result has been a fragmented overview of the Aboriginal culture. The Stories of the Dreaming are more than myths, legends, fables, parables or quaint tales. They are definitely not fairytales for amusement of children. Down through generations, the Aboriginal people’s stories, were told orally, but were never written down. They were the oral textbooks, of their accumulated knowledge, spirituality, and wisdom, from when time began. The structure and form of a traditional Dreamtime story is quite unique and cannot easily be copied. 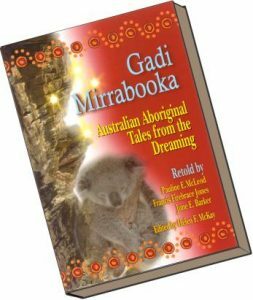 An oral Dreamtime story of ten minutes’ length, can cover several topics and subject matters, and be suitable for all age groups. They are structured with valuable lessons for children, or for bringing a renewed understanding to older people.